During a MULTI-ReUse project meeting at the beginning of September the state of the project and upcoming working steps were discussed. 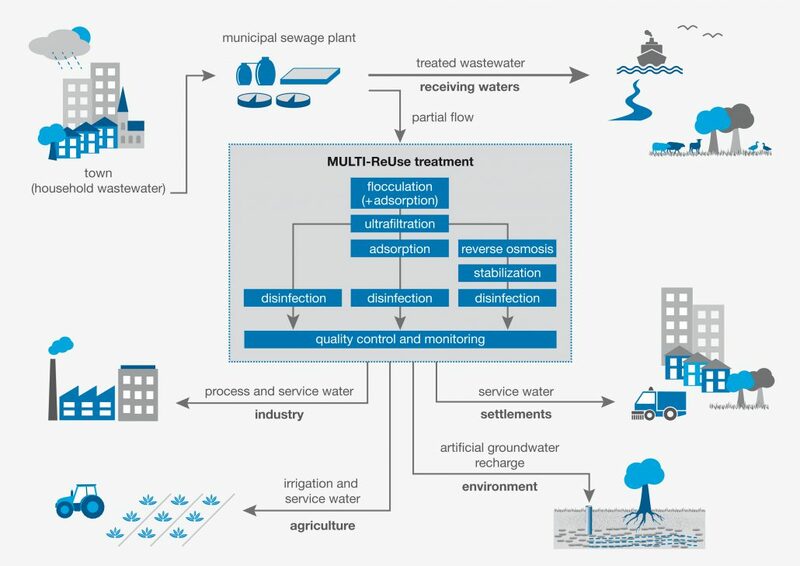 At our pilot site at a water treatment plant in Nordenham in Germany, intensive research studies about different water reuse concepts – mainly for industrial and agricultural purposes – have been carried out. The process steps flocculation, ultrafiltration, reverse osmosis, activated carbon dosage, activated carbon filtration and UV-disinfection were combined and optimized and are now going into long-term testing for further optimization. At the same time, innovative monitoring procedures for recontamination- and biofilm potential were developed. They are going to be used for quality control during the next few months. The microbiological monitoring is furthermore complemented with toxicological tests, to monitor possible effects on the produced water. Another field for studies during the long term testing phase are possible reactions of the water with the piping materials. Here the risk of biofilm deposition and development of corrosion are tested. To present the project to an interested audience in a convenient way, the touchtable, an interactive presentation medium was developed. It is a console with a digital interactive work surface. It conveys the research issues and the central results in a visually appealing manner and enables the content to be tailored to suit the different target groups. In order to present the possible methods for water reuse developed in the project, the MULTI-ReUse touchtable can be flexibly used at trade fairs or congresses. Its usual location is at the museum of project partner OOWV (Oldenburg-Ostfriesischer Water Association) in Diekmannshausen in Lower Saxony, Germany.